We are so excited. We have reached a milestone on our Teachers Pay Teachers Store. We are ready to celebrate! Next week TPT will be featuring our resource, The One and Only Ivan Novel Study Unit Plan. To celebrate we are offering The One and Only Ivan Novel Study Unit Plan for 20% off April 11-14. It’s not just about the earnings. We are excited to know our lesson plans and unit plans are in classrooms all over the world. We believe all students deserve great teachers and we feel strongly that our work supports teachers in becoming the teachers they really want to be. Be sure to take advantage of the savings and please leave us your feedback. We honor your opinion and plan our new resources to meet those needs. 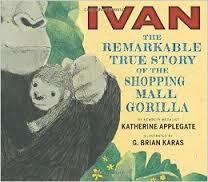 The One and Only Ivan is one of our favorite books. 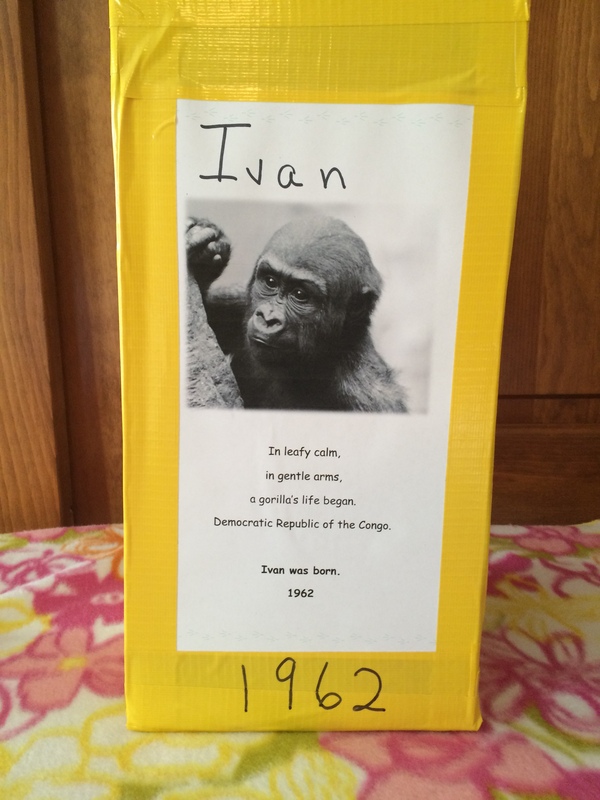 I’ve written about it before in Five Reasons to Read The One and Only Ivan in Your Classroom. Winner of the 2013 Newbery Medal and a #1 New York Times bestseller, this stirring and unforgettable novel from renowned author Katherine Applegate celebrates the transformative power of unexpected friendships. Inspired by the true story of a captive gorilla known as Ivan, this illustrated novel is told from the point-of-view of Ivan himself. The unit plan for The One and Only Ivan, winner of the 2013 Newbery Medal, is designed to engage students. Students are provided opportunities to analyze settings, identify, describe and analyze characters and their relationships, determine emerging themes, and use text references and quotes to infer meaning. The unit employs multiple delivery modalities, facilitates students’ cognitive thinking skills, and uses a constructivist approach to teaching and learning. Lesson plans are student-centered and are ready to implement. This unit is planned as a 3½ week unit, however, it is easily adaptable to 4 to 6 weeks. Download Free Bookmarks for The One and Only Ivan. The really good teachers are able to read a child’s story, and recognize the remarkable opportunity to help author that story. The really good teachers know how to script confidence and success onto the blank pages. They know how to edit the mistakes. And they want to help write a happy ending. Really good teachers know they have the ability to make a child happy or sad, to make a child feel confident or unsure, to make a child feel wanted or discarded. And students know when we care, when we care enough to read their stories. It is important to really get to know your students. This lesson is student-centered and is designed to engage students in the process of learning. In this lesson students will explore adjectives to describe themselves. By doing so, students will learn how adjectives help describe what kind of people they are. This lesson works on enhancing descriptive language as well as helps promote the understanding of self and value of self. This is an excellent choice for getting to know students better and will help build classroom community. This lesson is available on our store at Teachers Pay Teachers. Check out our other products too. We like this video too. It made you laugh, cry (a lot), even visit your nearest bookstore to read the source material — and now it has the year’s biggest MTV Movie Award. In his speech, John Green spoke of the young cancer patient who inspired his novel, Esther Earl. Esther can teach us all about valuing the lives of all people including all of our students. Perhaps this is why this story resonates with adolescent readers. We think it is an excellent book for high school students, and it is a way to connect with popular literature and media in the classroom. That’s why we’ve developed an excellent teacher resource for using the book in the classroom. See John give his speech. 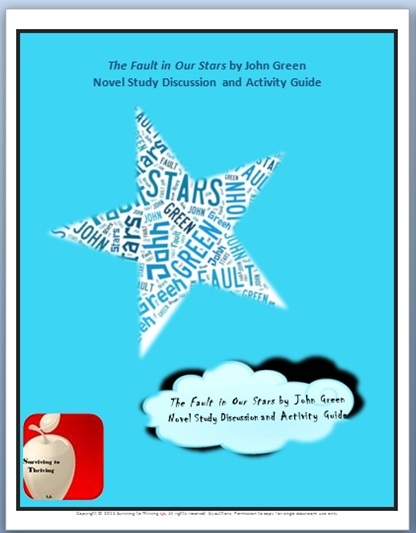 The novel study for John Green’s novel, The Fault in Our Stars, includes a Discussion and Activity Guide, accompanying PowerPoint Presentation, a Literary Log for students, optional homework assignments, summative assessments and rubric, and bookmarks. The Discussion and Activity Guide is comprised of questions, prompts, and/or activities for each chapter and offers teaching suggestions, vocabulary, and suggestions for a variety of ways in which students might respond to prompts: Teacher-Led Discussion, Pair-Share, Write-Pair-Share-Class-Share, Individual Student Response, and Small Group Mini-Projects. Questions, prompts, and activities are designed to increase the relevancy of the novel and facilitate critical thinking. Many of the questions and prompts could be used for longer writing pieces or mini-projects. Teaching Notes are includes throughout the Discussion and Activity Guide—they are optional ideas or strategies to enhance teaching and learning. Students like to talk and this guide engages and encourages discussion. It can be used with the whole class, small groups, individual students, or for teachers who choose to read aloud The Fault in Our Stars to students. An accompanying PowerPoint Presentation facilitates student activities and can be utilized by teachers or students. The Literary Log for students includes all the questions, prompts, and activities in both the Discussion and Activity Guide and PowerPoint Presentation. Graphics on both the PowerPoint slides and the Literary Log serve as visual clues; these graphics work especially well with students whose first language is not English or for students who are primarily visual. The Literary Log for The Fault in Our Stars can be used by a whole class as well as small group of students or individual students reading the novel independently. There are nine optional homework assignments designed to enhance and extend the relevance of the novel. Homework assignments include: three Survey. Note. Conclude! ; Self-Metaphor; Montage; Blog Entry; Obituary for Augustus; Author Analysis; and Word Analysis for Love. Summative Assessments include 12 projects designed for a variety of learners as well as Blooming with Knowledge about The Fault in Our Stars, which includes 12 activities connected to Bloom’s Taxonomy. Each level includes two choices. You may elect to direct students to choose one activity from each level or allow students to choose any number of activities. The accompanying rubric can be used with both the Summative Assessments and Blooming with Knowledge. Reproducible bookmarks can be used to discuss bookmark quotes, form groups, or simply keep students’ place in the novel. Connections to best practice and the Common Core State Standards are included. Our newest product is out: Animal Farm Novel Study Discussion and Activity Guide. Animal Farm by George Orwell is a staple on middle and high school literature reading lists. If you haven’t read Animal Farm with your students you should. It is a great book to engage student interest and teach important concepts. This novel study for George Orwell’s novel, Animal Farm, includes a Discussion and Activity Guide, accompanying PowerPoint Presentation, a Literary Log for students, optional homework assignments, summative assessments and rubric, animal cards for forming groups, and bookmarks. The Discussion and Activity Guide is comprised of questions, prompts, and/or activities for each chapter and offers teaching suggestions, vocabulary, and suggestions for a variety of ways in which students might respond to prompts: Teacher-Led Discussion, Pair-Share, Write-Pair-Share-Class-Share, Individual Student Response, and Small Group Mini-Projects. Questions, prompts, and activities are designed to increase the relevancy of the novel and facilitate critical thinking. Many of the questions and prompts could be used for longer writing pieces or mini-projects. Teaching Notes are included throughout the Discussion and Activity Guide—they are optional ideas or strategies to enhance teaching and learning. Students like to talk and this guide engages and encourages discussion. It can be used with the whole class, small groups, individual students, or for teachers who choose to read aloud Animal Farm to students. An accompanying PowerPoint Presentation facilitates student activities and can be utilized by teachers or students. The Literary Log for students includes all the questions, prompts, and activities in both the Discussion and Activity Guide and PowerPoint Presentation. Graphics on both the PowerPoint slides and the Literary Log serve as visual clues; these graphics works especially well with students whose first language is not English or for students who are primarily visual. The Literary Log for Animal Farm can be used by a whole class as well as small group of students or individual students reading the novel independently. There are four optional homework assignments designed to enhance and extend the relevance of the novel. Homework assignments include: two Survey. Note. Conclude!, Motto & Maxim, and Battle of Cowshed Extension. The optional triad mini-project activities include Totalitarianism Triad, Chapter Analysis, and Exposé: Sugarcandy Mountain. There are 10 different animal cards that can be used to form student groups of three (triads). Blooming with Knowledge about Animal Farm includes 12 activities connected to Bloom’s Taxonomy. Each level includes two choices. You may elect to direct students to choose one activity from each level or allow students to choose any number of activities. The accompanying rubric can be used with Blooming with Knowledge. Connections to best practice and the Common Core State Standards are included. We think you will love this book and appreciate this student-centered, best practice approach to using it in your classroom. Check it out on our TPT store. Ideas for National Poetry Month. Introduce poetry to your students by reading poems aloud that they are interested in. Poems by Jack Prelutsky and Shel Silverstein are all-time student favorites. Have students keep a Poetry Journal. Write poetry with your students and share all the poetry on a bulletin board or publish a class poetry book. Introduce a new poem each day. Have students create poetry collages. Cut words from magazines to make poetry posters. Consider having a poetry slam, a “competition” at which poets read or recite original work. Video students reading their poetry. Include music. Remember lyrics are poems. Celebrate with our Poetry Journal. Our Poetry Journal for the Classroom includes a reproducible student poetry journal, a variety of poetry forms, sample poems, practice pages, and final student poem pages. Our newest product . . . The packet includes Pre-Reading activities, a Pre and Post-Reading Vocabulary activity, During-Reading activities with prompts focusing on quotes and illustrations, and After-Reading activities that include ideas for extensions and differentiation. Activities are intentionally designed for students to communicate their ideas and knowledge in a variety of ways including writing, researching, illustrating, proposing, and presenting. The packet includes implementation plans, student handouts, and connections to Common Core Standards and Best Practice. Reproducible student bookmarks can be used as prompts for writing, and Ivan grouping cards can be used for forming student groups. Ivan: The Remarkable True Story of the Shopping Mall Gorilla is a nonfiction picture book that tells the real story of The One and Only Ivan. We love reading all kinds of books and are big fans of John Green. Green’s novel is elegantly plotted, and as sad in places as one might expect a book about adolescent cancer to be. But it’s also brimming with joy. Hazel and Augustus have a zeal for living and for each other that, cancer or not, is rare, and it’s a delight to see their plans unfold and relationship flourish even as they both face death. Summative Assessments include 12 projects designed for a variety of learners as well as Blooming with Knowledge about The Fault in Our Stars, which includes 12 activities connected to Bloom’s Taxonomy. Each level includes two choices. You may elect to direct students to choose one activity from each level or allow students to choose any number of activities. The accompanying rubric can be used with both the Summative Assessments and Blooming with Knowledge. Reproducible bookmarks can be used to discuss bookmark quotes, form groups, or simply keep students’ place in the novel. Connections to best practice and the Common Core Standards is included.